(CNSNews.com) - On a day when we expect to learn more about Special Counsel Robert Mueller's various investigations, President Donald Trump may be anticipating bad news. 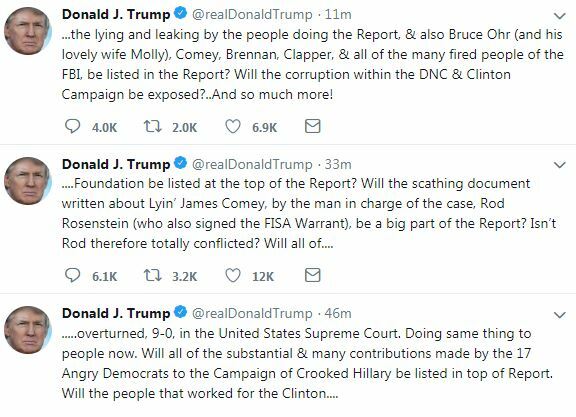 In five furious tweets early Friday, he once again blasted Mueller, former FBI Director James Comey, Deputy Attorney General Rod Rosenstein and others as well as "big time conflicts of interest." ...the lying and leaking by the people doing the Report, & also Bruce Ohr (and his lovely wife Molly), Comey, Brennan, Clapper, & all of the many fired people of the FBI, be listed in the Report? Will the corruption within the DNC & Clinton Campaign be exposed?..And so much more! Mueller on Friday is expected to file sentencing documents on former Trump attorney Michael Cohen. Those documents may give additional insight into what Cohen has told the Special Counsel's team, and what that team is investigating that may affect the president or his family. Additionally, Mueller will file documents explaining crimes committed by former Trump campaign chairman Paul Manafort, who had been cooperating with the Special Counsel until Mueller accused him of breaking the plea agreement. "It has been incorrectly reported that Rudy Giuliani and others will not be doing a counter to the Mueller Report. That is Fake News," Trump tweeted. "Already 87 pages done, but obviously cannot complete until we see the final Witch Hunt Report. And then another one: "We will be doing a major Counter Report to the Mueller Report. This should never again be allowed to happen to a future President of the United States!"